We’d love your help. Let us know what’s wrong with this preview of Deep Freeze by Philipp Bagus. The economic crisis led to a political crisis, wit It was a modern thriving economy one day, and then, suddenly, the food disappeared from the shelves, the banks closed, and the ships stopped arriving. 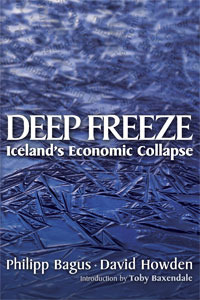 Iceland in 2008 experienced an unprecedented economic meltdown that struck fear in the hearts of people all over the world. If it could happen here, it could happen anywhere. 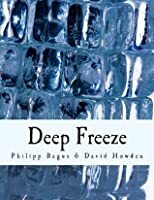 To ask other readers questions about Deep Freeze, please sign up. Nice read- illustrated the circumstances surrounding the lead up to the financial crisis, and its' effect on Iceland's economies, culture and future industries. Easy to follow, generally interesting, provides decent insight without weighing the reader down in too much analytical depth. “Deep Freeze” is a fascinating look inside the 2008 financial crisis in Iceland, the country arguably hit hardest by the global collapse. Bagus and Howden walk the reader through the boom in Iceland, what caused it, how the wheels came off, and where Iceland stands today. The best thing: it is available for free in PDF form on the Von Mises Institute web site! Bagus and Howden do a great job to dispel any notion that Iceland’s meteoric rise and fall had anything to do with the effects of free mar “Deep Freeze” is a fascinating look inside the 2008 financial crisis in Iceland, the country arguably hit hardest by the global collapse. Bagus and Howden walk the reader through the boom in Iceland, what caused it, how the wheels came off, and where Iceland stands today. The best thing: it is available for free in PDF form on the Von Mises Institute web site! Bagus and Howden do a great job to dispel any notion that Iceland’s meteoric rise and fall had anything to do with the effects of free markets and deregulation. To the contrary, the humongous bubble in Iceland was brought about by inflationary central bank policy and government guarantees. Though central banks throughout the Eurozone and in the United States implicitly promised bailouts for large failed financial institutions, the Central Bank of Iceland explicitly made these promises. The Icelandic government also made mortgage loans directly to customers, competing against Icelandic banks for mortgage customers. The Fed’s policies leading up to the 2008 crisis were idiotic, but the CBI’s policies were downright disastrous. The combination of government mortgages and explicit bailout promises led to moral hazards that far exceeded anything we saw in the United States. The monetary expansion and price inflation that arose from these policies caused a temporary boom, but also caused a fantastic collapse. Resources were misallocated from the productive resource-based industries to finance, also resulting in a construction and real estate boom. As has been the case time and time again with these types of bubbles, the ability to borrow money at artificially low interest rates caused people to chase progressively riskier investments in order to earn a healthy return. Also, businesses and entrepreneurs misjudged the amount of capital that was saved; low interest rates typically indicate that the public is delaying its consumption until a later date, at which time long-term projects would pay off. Instead, artificially low rates dupe businesses and entrepreneurs into poor investments on these long-term projects. When the bubble pops, these poor investments are exposed. Though this is a short book, Bagus and Howden pack it with plenty of information. There are plenty of graphs, statistics, and quotes to support all of the inferences and commentary. Iceland is just as fascinating after the boom as it was before the boom. The tiny fishing country that turned into a financial powerhouse was an international story, but the story of how it all went wrong should continue to be international news. I read this book as research on economic collapse for my upcoming novel The Internet President: None of the Above. Of all the books on the topic, this was my favorite. The book is on the short side, but I didn't feel cheated by that because of how riveting the story was. Iceland got hit the hardest of the economies in the 2008 financial crisis, a 90% collapse in their stock market. One thing that makes Iceland special it took all the pain at the end of the collapse. This may be a preview for Amer I read this book as research on economic collapse for my upcoming novel The Internet President: None of the Above. Of all the books on the topic, this was my favorite. The book is on the short side, but I didn't feel cheated by that because of how riveting the story was. Iceland got hit the hardest of the economies in the 2008 financial crisis, a 90% collapse in their stock market. One thing that makes Iceland special it took all the pain at the end of the collapse. This may be a preview for American and the rest of Europe. In the rest of the western civilization easy money delayed the reckoning. Our story is not yet complete. So it's important we learn from Iceland as a modern example of collapse. 1. mixed maturities (buy short term loans, sell long term loans) which pumps your profits as long as you have liquidity (people willing to lend to you). 2. Foreign exchange risk (buy foreign currency, sell local currency) which pumps profits by using a currency with lower interest rates. However, you can get hammered by changes to currency exchange rate changes. 3. Moral hazard from assumed bailouts. Assumed invincibility often proves otherwise. 4. Booms let businesses that aren't that efficient get funding. These businesses would normally fail. When the bust comes, they will fail at the same time. The book follows the entire arc of the crisis from originating causes to the final reckoning. I highly recommend reading the book. A decent account of the crisis in Iceland post ‘08 and an enthralling read.